Upper and Lower Yoder Townships, lying south and west of Johnstown, jointly mark their diamond anniversaries this year . They were simultaneously established 75 years ago through a series of land divisions which ultimately carved up old Conemaugh Township -- one of the three original townships in Cambria County. Conemaugh Township once embraced a vast land area that covered all of southern Cambria County. At one point, it extended as far north as the present Blacklick Township. Within its original boundaries, many boroughs have since been chartered and the remaining land area divided into 10 townships. Upper and Lower Yoder Townships are two of the latter. The first land split which led to the formation of the two hilltop townships came on July 17, 1858. On that date, a large area was severed from the original Conemaugh Township. It covered the wouthwest corner of Cambria County where it borders Somerset County to the south and Westmoreland County to the west. Within this acreage of hill and forest was the John Yoder farm, and for many years the hillside west of Johnstown had been called Yoder Hill. And when the newly-created political subdivision ws created by the courts, it became known as Yoder Township. It remained a single township until September 1, 1879, when by court decree, it was split into Upper and Lower Yoder Townships. Each township has since been the birthplace of a new municipality. Westmont Borough was once a part of Upper Yoder and Brownstown Borough formerly was in Lowr Yoder. 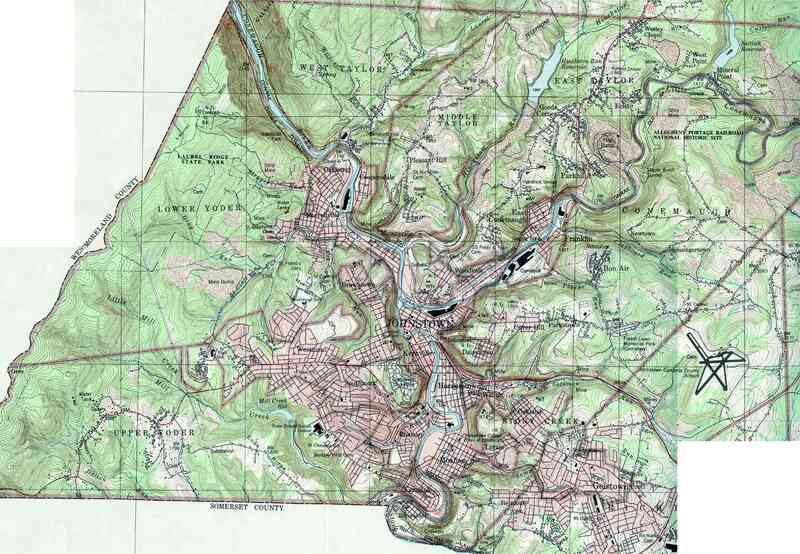 In addition, part of Lower Yoder became Oakhurst Burough which later was annexed to Johnstown. John Yoder, for whom the townships were named, was one of the earliest settlers in the hilltop area and possibly the first to establish a permanent farm there. It was about 1820 that he migrated from Listie, near Somerset. He found the hilltop area rich in timber and secured rights to the land by homesteading for a few cents an acre. Other early families in Yoder Township were the Harshbergers who settled in the district now called Elim, and the Berkleys, who farmed the Berkley Hills area. The names of these early settlers remain as place names in Upper Yoder Township. For the greater period of their existence Upper and Lower Yoder Townships were principally farmland. Today, they are residential areas with a minimum of commercial enterprises, a notable exception being the modern shopping center in Lower Yoder Township. The movement toward residences got underway after the Johnstown Flood of 1889. The first residential area sprouted in the section which later became Westmont Borough and gradually expanded through the two townships. Date Created: 9 Sep 2003. Lynne Canterbury, Diann Olsen, & contributors.